If you need more than that one word review of this dull tome read on. A middle-class man comes home late from work to find his wife gone. All her things still there – including purse and phone and all the things a person would take even if only leaving for a moment. Tom is annoyed, then a bit worried. Mostly for himself. Meanwhile an unidentified, middle-class lady has had bad car accident while in an unsavoury part of the city. It will surprise absolutely no one who has ever read a book or seen a movie that she is Tom’s missing wife, Karen, though the tone implied this was A Twist of Alarming Proportions. Additional unsurprising elements of the story include a case of amnesia, a hidden past for one of our not-so-happy couple, an unexplained dead body, an extra-marital affair and a barking-mad, childless neighbour. Am I being too harsh? Possibly. But I can’t help it. Everything about this book is just so bland and predictable. That there is nothing new in the storyline need not have automatically made the book virtually unreadable but the entire thing has a tepid quality to it. Like someone from a government agency had documented a citizen’s worst nightmare on form 729B and in so doing smoothed away all of the interesting bits. Familiar plot devices and genre tropes are thrown in almost at random, certainly without subtlety or innovation, and there is a lot of telling and precious little showing throughout the book. The characters are two dimensional; totally lacking in believable emotions or inner voices. Tom is a self-absorbed dullard whose love for his wife runs about as deep as a bird bath in a drought. Karen’s supposed troubles always read like someone talking about bad things, never like actual experiences a human being was actually going through. And the deranged neighbour lady is just a joke. For a much more nuanced and authentic-feeling characterisation of a woman driven to a kind of madness by her unfulfilled desire for motherhood check out Michael Robotham’s THE SECRETS SHE KEEPS rather than this dreck. There is nothing memorable about the setting either. For ages I thought we might be in Canada because that is where the author lives but then one of the cardboard cutout cop characters said something like “that’s a big offence here in New York“. I assume the state rather than the city given there was a vague Stepford quality to the little enclave where Tom, Karen and the delusional neighbour lady live but I don’t care enough to work it out. Or, as I have said before, meh. As always, other opinions about this book are available including that of my fellow book club member Kerrie over at Mysteries in Paradise. 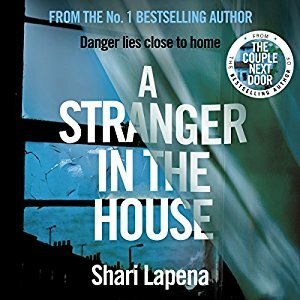 This entry was posted in book review, Shari Lapena, USA. Bookmark the permalink. The differences between your take on this and Kerri’s would encourage me to read it just to see, but this is not the type of book I am attracted to anyway, so I will leave it alone. It is good to have your honest opinion. Love your review. Why do you have trouble with Fred Vargas Adamsberg books? I love them. Tell me why so I can reconsider. Oh my problem with Vargas’ Adamsberg books is all my fault…It’s the surreal/paranormal elements I can’t deal with. My brain is just not wired for that particular kind of fantastical element. My main beef at the moment is, in fact, less about the novels than the atrociously unimaginative, cliché-ridden and just plain poorly written synopses the publishers/Amazon inflict on us. Grammar and structure appear to be optional. I’ve recently become so phobic about this that I’ve taken to buying books on the strength of their covers. Although you wouldn’t want to get me started on women in coats walking away in fields, forests and on dirt roads… Oh look! An ellipsis! LOL Robin I totally agree about the synopses problem these days…to the point that I never read them, or at least not until after I’ve read the book. They either contain major spoilers or have no resemblance to the actual book they are for. I don’t know that I could choose books based on covers either as, like you say, there are some recurring themes that make it difficult to distinguish one from another. In addition to the women in coats one that you highlight there is the silhouette man running down an alley/through an oversized doorway. And for a while there seemed to be a thing about Angel statues (or parts thereof, particularly the wings) though that seems to have disappeared lately. Happily I have a few trusted friends and blogs that I get my recommendations from, otherwise I don’t know what I’d read. I had given up on Karin Slaughter after a particularly over-the-top story in her series but I have heard lots of great things about The Good Daughter so I am tempted to give that one a go. Yes! And the silhouette man with a gun – a very busy chap! Karin Slaughter’s last effort in the Will Trent series is no doubt the one you mean. I agree – she completely lost the plot there as the swags of negative reviews on Amazon attest. It was atrocious. That was really disappointing as prior to that one she hadn’t really put a foot wrong. The Good Daughter redeems her — it’s not without flaws, but it really engaged me nonetheless. So many series authors chuck in a shocker out of the blue. Val McDermid and Patricia Cornwell are getting a bit hit and miss, with more than a few bad misses from both of late. I keep reading their stuff but don’t rush off and buy their new releases immediately any more. Great review. Thanks so much for your honesty. Being an older reader, I must choose my books with care. This is one that I will definitely skip. I know what you mean about choosing books with care these days…I too feel like there is not enough years left to spend with crappy books. I would have left this one unfinished except it was for my book club and I do try to finish those so I can join in the discussion. Now that you mention it I think it was the violence that bothered me about the Karin Slaughter book – one of the characters just kept having truly awful, violent things happen to her. I do tend to find that more with the American writers for some reason. I gave up on Linda Castillo’s books for the same reason – I just couldn’t stomach that level of violence. And you’re right – sadly violence in American mysteries & thrillers lately seems to have become much more graphic. It was Castillo’s second book that I found too violent to handle – maybe the rest are not so bad but I’m not going to find out. The second one opened at a farm house at which a whole family had been murdered – I listened to the audio book and remember it taking nearly an hour – or 4 chapters of the print version – to describe every awful depravity that had been committed against the various family members. Then later someone finds some video footage of the killings and there’s more violence as the footage is described in lengthy detail. I just do not need this kind of thing in my life – or my reading. Your reviews are always a treat, whether negative or positive or lukewarm. I can’t read Karin Slaughter’s books, too violent. Nor Val McDermid’s series about police officers that’s violent. I do like some of her stand-alones and the Karen Pirie series. On Fred Vargas, there are definitely two camps of readers. I am in the pro-side and I don’t find her “paranormal” aspects are involved in solutions. She loves medieval and peasant myths,, folklore and superstitions. But she always has a material explanation of the murders, no matter how quirky the story gets. There is one exception to that, but Adamsberg and Danglard disagree, with the latter giving the scientific explanation. Adamsberg equivocates, but I think Vargas was just being provocative with her readers, toying with us. She is a historian and archaeologist, and does have to rely her research on science.